This giveaway is now closed. Thanks for entering! See who won here. Happy first Friday of the new year! 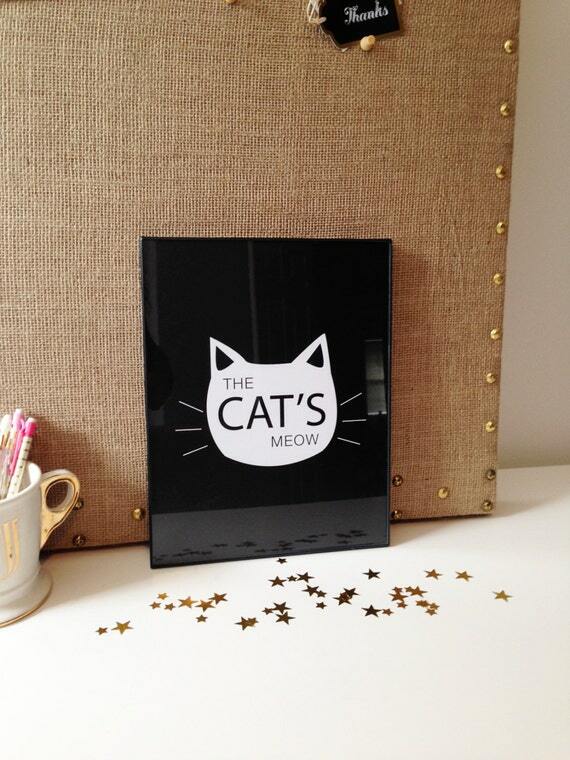 The Smitten Collection is here to celebrate with beautiful art with a humorous side. 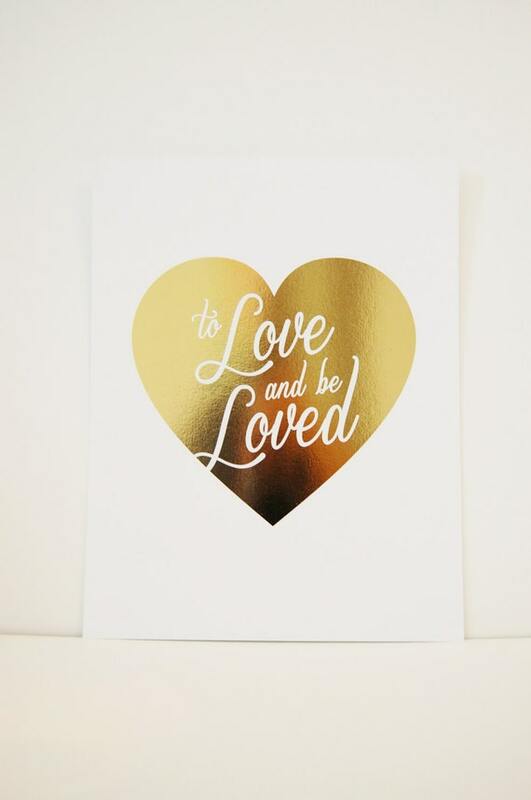 This Gold Foil Heart To Love and Be Loved print is perfect for a bedroom. And hello, it’s gold. 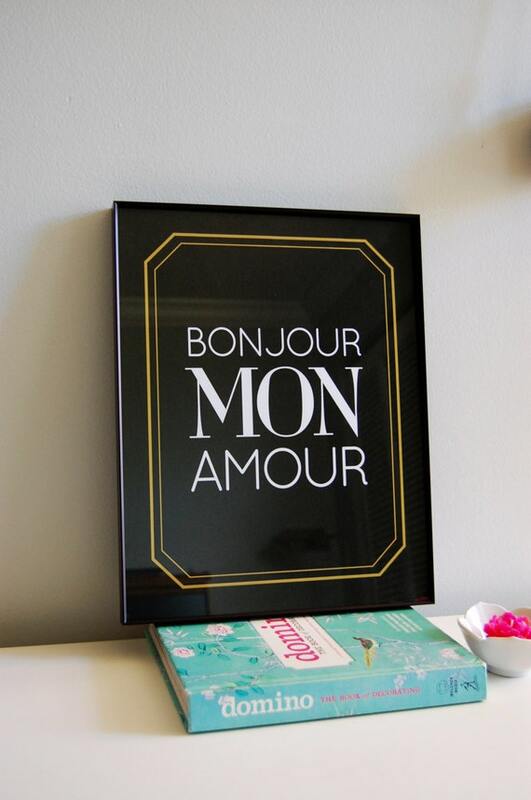 Bonjour Mon Amour, for that special someone. The Cat’s Meow is just too cute and fun. 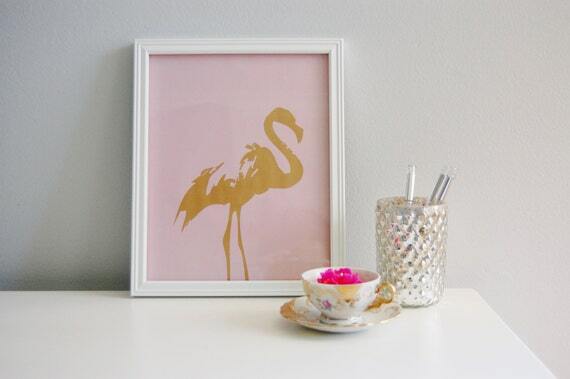 Who can resist a Gold Flamingo? That’s right, you can’t. 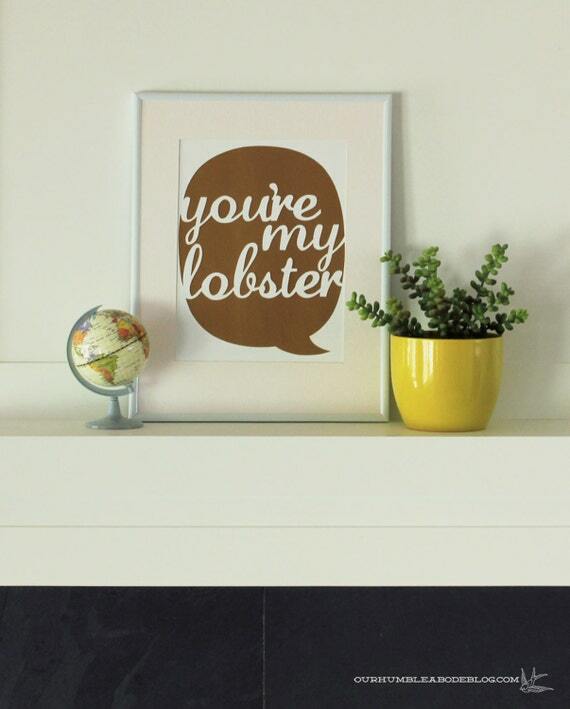 And we’re teaming up so you can get your hands on any text bubble art, like You’re My Lobster Text Bubble Cut Out. The Goods: One print of choice from The Smitten Collection and one Text Bubble Cut Out from me. Just for Fun: What is your main home goal for 2014? To get organized? Finish up a lingering project? 1. Follow The Smitten Collection blog, then leave a second comment here. 2. Follow @thesmittencollection on Instagram for another entry. 3. Like Our Humble Abode on Facebook, and comment again for four total entries. Contest Closes: Thursday, January 30th. Number of Winners: Two, chosen by Random.org. Ships: Anywhere in the US and our neighbors to the north, Canada. Other Info: We will select the winners using random.org and announce on Friday, January 31st. My main goal is to move to Florida!!! I already like you guys on Facebook! We’ve been in our new home for a year now and, having upgraded from an apartment, I have some serious organizing to do. Shelves need to be made for the garage and sorting needs to be done for holiday decor (I’m totally guilty of just piling stuff in our garage and it’s just terrible at this point). My main home goal is to finish our kitchen renovation. We moved 2 years ago but lost steam after making the house livable. Lots more to do to make it pretty too! Goal #1 – New windows. We may as well leave them open to the sub-zero MN winter, for all the good they’re doing right now! I follow you on Facebook, too! Thanks! My main goal is to paint my kitchen cabinets white–they’re a little worse for the wear! Still following you on facebook! I favorited the Smitten Collection shop! Our main goal is to have our upstairs floors refinished and finally enjoy the house this summer (last summer all we did was renovate). We just installed new floors. Our next main goal is to paint kitchen cabinets. My main goal is a good deep cleaning of the entire house. It’s been waaaaaay too long! My goal is to re-face the fireplace in our living room! We finally just finished our basement, so now I need to tackle the massive mess in the storage room. To get more organized if possible. My goal is to DE. CLUT. TER! And then start figuring out our priorities in redecorating our rooms. I have two goals. I want to finish the projects that we’ve started (there are many) and declutter. I’ve already tackled one room and hope to get at least one done a month (more if I can). Looking for new prints for the livingroom walls? Here’s a chance to win from some of the greats on etsy! Via one of our very fine Word press hosted blogs is running a contest to WIN your favs. Enter through here, or the original post “January Giveaway” from OurHumblrAbodeBlog.com 😀 Be sure to visit both etsy shops that present more of the artists work for sale as well. and hey! Happpy New Year! I am in love for these prints! My main home goal is to EITHER move into a bigger apartment (I really need an office!) OR, if we can’t find anything affordable in the Boston area which is highly likely, finally paint our existing apartment. The trim and fireplace mantle in the living room are lavender. The bathroom is glossy crappy Cookie Monster Blue. We need to paint. Get the house ready in case we decide to sell it next summer. I’m hoping to buy a sleeper sofa and a TV. Our main goal is to finally finish our basement this year! My goal this year is to be debt free. I Like Our Humble Abode on Facebook. I follow The Smitten Collection Blog. I follow @thesmittencollection on Instagram. I am following The Smitten Collection blog. I’m following The Smitten Collection on instagram. My main goal is to finally get my husband to repaint the bathroom!! My main goal is to get rid of 50% of my possessions–I had a brain tumor last year –and spent an extended amount of time in the hospital worrying about my dear husband and children having to sort my positions. I love that flamingo! My home goal for 2014 is to de-clutter my small studio apt. Hoping to finally get our basement fully refinished and ready to use! I vow to remodel the kitchen this year – can’t wait! 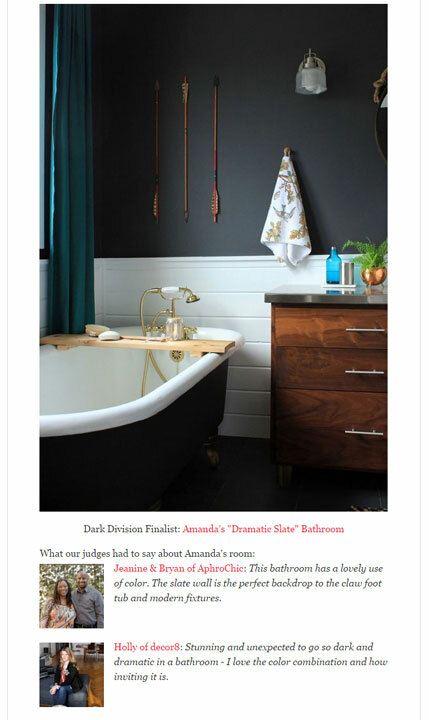 My main home goal is to get all of our bathrooms remodeled…3 of them! My goal is to finish up the projects we have started or prepped. My main goal for 2014 is to pair down and keep things simple. My main goal is to ORGANIZE and throw out clutter!! My big goal is to move back from NZ to the US, choose a city to live in and find a house to make into a forever home for us and our three girls. No pressure, we leave in two weeks, aaaargh!! My main goal for 2014 is to get our basement into some semblance of order. This year I really mean it!! My main home goal is DEFINITELY to purge and simplify. I am craving simplicity!! And I follow her blog. She rocks. My house goal this year is to finish up on projects that I have already started!! I followed Judith on IG. I “liked” your FB page! My main goal is to survive moving! My goal this year is to be more available to my boys. My Air Force hubby is leaving for training next week, so while he’s gone I want to pour more of my time and effort into my little guys. We leave for our new base next month so one of these pieces would be so fabulous to help make our new space into a home. Thanks for the great giveaway. I ‘like’ you on Facebook. All the best for 2014!!! my main goal is to organize better! As cliche as it is, my main goal is to get organized, but doing so in a stylish way. My favorite piece from “The Smitten Collection” is the Bonjour Mon Amour piece, and my favorite speech bubble art is the “Hello Lovely”. So quirky and fun! I follow “The Smitten Collection” on Instagram. I follow “The Smitten Collection” blog. Our main house goal is to get a nursery ready for a baby arriving in May! Our main house goal is to do a bunch of small lingering projects that have been driving me crazy! We’re hoping to do some work on our back porch. Would be nice to have it done in time for summer! Oh so many things! I think #1 is getting the yard cleaned up! These are all gorgeous prints. Main goal for this year is our living room. We have to completely gut and redo – it’s probably going to be more work that the kitchen…here’s hoping we can stay focused and get it done in less time though hehe.